New York, NY (July 6, 2015)—First Second, an imprint of Macmillan, has acquired world rights to an all-new graphic novel series by Bryan Konietzo, the co-creator of the Avatar: The Last Airbender animated series. The first volume will be on sale in 2017. Threadworlds is set on a group of five planets that share a single orbit. The Earth-like worlds are teeming with life, and they have all evolved their own unique intelligent species, each in a staggered state of technological progress. The hero of the story is Nova, a budding young scientist from the most primitive of the Threadworlds. Stubborn and brilliant, she lives out of step with her superstitious, oppressive empire, where girls are forbidden to read and write. But nothing can quell Nova’s passionate curiosity and awe of the universe. Her epic adventures, told in five volumes, follow a chain reaction of scientific discoveries as they ripple from planet to planet. Scientific pursuits sweep her up in a thrilling journey that links the fates of the planets and unite the powers of their brightest minds in a pursuit for truth and progress. “I have dreamed of doing a graphic novel project since art school. My career took a different path for the last seventeen years, but I am finally getting around to it! Co-creating and producing Avatar and Korra was an incredible experience, but as an artist and writer I have longed to find a more intimate connection with the making of my work. The artists on our animation productions were so incredibly talented and inspiring that I got the itch to strike out on my own and test my mettle in this neighboring medium,” said Bryan Konietzko. “Once I came up with the idea for Threadworlds and spent some time thinking about its main character, Nova, it became less of a choice and more of something I simply had to do. The things Nova wants to learn, I want to learn. I am compelled to go on this journey with her and explore these worlds together. And I am lucky to have found a wonderful home for this project in First Second Books, a unique publisher with an awe-inspiring stable of creators. My editor Mark Siegel’s enthusiasm and integrity have been great sources of motivation for me to take this plunge. Wish me luck! I have a lot of writing and drawing to do,” he added. Bryan Konietzko graduated with honors from the Rhode Island School of Design’s illustration department in 1998 and moved to Los Angeles. He wore many hats in the TV animation industry before teaming up with fellow RISD alum Michael Dante DiMartino to create two internationally acclaimed series, Avatar: The Last Airbender and The Legend of Korra. Bryan served as executive producer and art director on both productions, co-writing scripts with Michael when his schedule permitted. In 2014, Montserrat College of Art awarded Bryan with an honorary doctorate of fine arts. He is also an electronic musician under the name Ginormous and an avid nature photographer. His wife, Lisa, and their dog, Gunther, keep him healthy and happy. 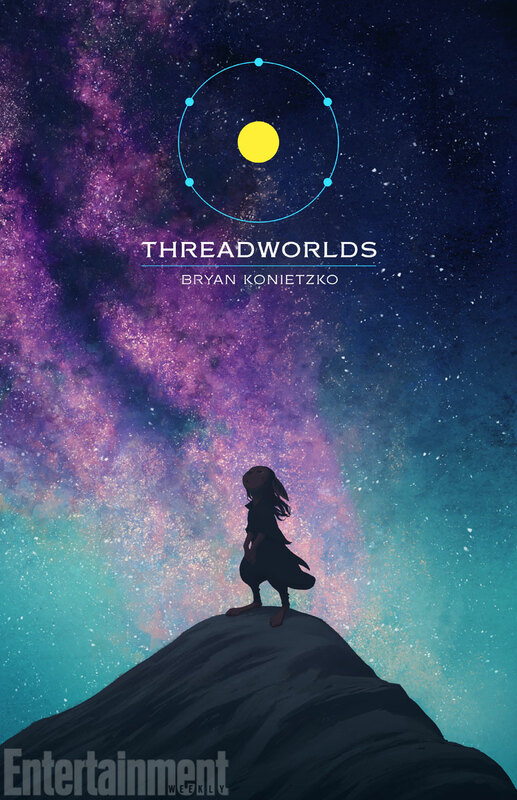 Threadworlds is his debut graphic novel. You can read an interview with Bryan here. Macmillan Publishers is a global trade book publishing company with prominent imprints around the world. Macmillan publishes a broad range of award-winning books for children and adults in all categories and formats. U.S. publishers include Farrar, Straus and Giroux, Flatiron Books, Henry Holt & Company, Macmillan Audio, Macmillan Children’s Publishing Group, Picador, St. Martin’s Press, and Tor Books. In the UK, Australia, India, and South Africa, Macmillan publishes under the Pan Macmillan name. The German company, Holtzbrinck Deutsche Buchverlage, includes among its imprints S. Fischer, Kiepenheuer and Witsch, Rowohlt, and Droemer Knaur. Macmillan Publishers is a division of the Holtzbrinck Publishing Group, a large, family-owned media company headquartered inStuttgart, Germany. Tagged First Second, graphic novels, Nickelodeon, Threadworlds.